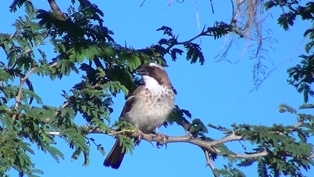 The first White-browed Sparrow-Weaver records from Zambia have been submitted to PHOWN. The subspecies is Plocepasser mahali pectoralis, which has dark markings on the breast. This subspecies occurs in Tanzania, Zambia, S Malawi, W Mozambique, N Zimbabwe and N Botswana. The colony sizes of the five pectoralis records ranged from 8-18, with an average of 13, which is a little under the global average in PHOWN of 1 - 15.6 - 58 (n=111). The new records were along the Zambezi River and may be viewed here: VM 2044, VM 2045, VM 2046, VM 2047, and VM 2048. To see all White-browed Sparrow-Weaver records see here.